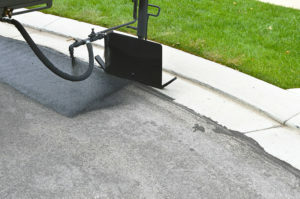 The hydraulic AutoTrim features a spray nozzle, hose and baffle that bolts on to the front of the machine and connects directly to the applicator’s sealcoat reservoir for a seamless operation. The system minimizes manpower and eliminates the hassle of manually holding a baffle and spraying material. Combined with Neal Manufacturing’s 6,000-cfm blower, contractors get a prep work powerhouse. Operators can clear debris with the blower and cut in with sealcoating materials as fast as 14 feet per second, seven times faster than what can be achieved manually, all without leaving the DA 350’s driver’s seat. The DA 350’s hydraulic blower offers triple the output of a typical walk-behind blower, for fast and thorough dirt and debris clearing. Contractors can rotate the blower and lock it in an upright position for transportation, or move it down for operation. The nozzle on the blower articulates 360 degrees, allowing contractors to blow debris in the optimum direction. Neal Manufacturing’s DA 350 Dual Applicator is a three-wheeled, self-propelled sealcoating machine that features a 350-gallon tank and allows contractors to apply sealcoat with squeegee and spray systems. AutoTrim is the industry’s first sealcoating baffle attachment. When paired with Neal’s 6,000-cfm blower, operators can clear debris and cut in sealcoat materials as fast as 14 feet per second, seven times faster than what can be achieved manually. Its heavy-duty diamond-shaped squeegee assembly has internal baffles that help distribute material more evenly than squeegee assemblies without baffles. After applying a coat with the squeegee, contractors can apply a second coat with the DA 350’s spray bar, which can expand up to 12 ft. wide. A spray coat also can be applied with a 6-foot hand wand connected to 75 feet of reinforced hose for added versatility on the jobsite. 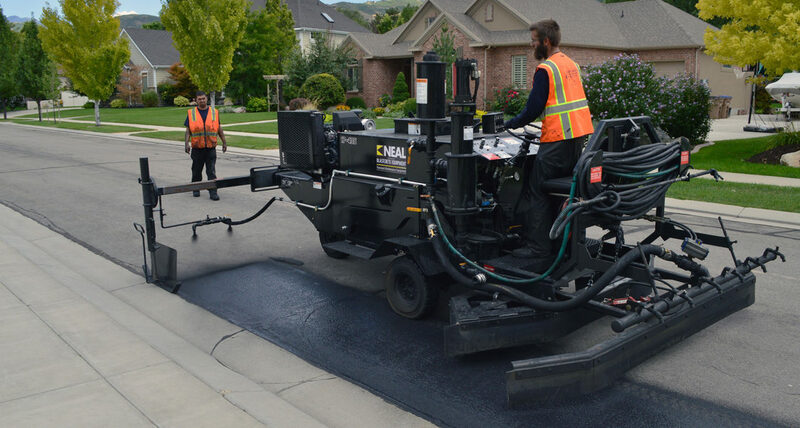 Neal Manufacturing’s dual application system gives contractors the ability to fill the voids in the surface of the asphalt with the squeegee. They can then apply a second coat with the spray bar for a smooth finish that completely seals the asphalt and lasts as much as 40 percent longer than a job done with two spray coats. To improve ease of use and operator efficiency, Neal Manufacturing’s DA 350 control panel allows users to access all electrical controls from one centralized location. Since many sealcoating jobs are done at night when there is less traffic, Neal Manufacturing added LED working lights to the front and back of the machine so contractors can easily work in the dark. The DA 350’s heavy-duty aggregate pump, or HDP, is a hydraulic-powered piston pump that comes standard on all Neal Manufacturing machines. It can transfer as much as 100 gallons of material per minute, which is the fastest transfer rate on the market and as much as 50 percent faster than diaphragm pumps. The HDP produces enough pressure to pump modified sealers, emulsions and mastics for asphalt roads, as well as mixes with as much as 10 pounds of sand per gallon, the ratio required for most state and federal projects. The high-efficiency pump only operates when pressure drops during spraying, resulting in reduced fuel consumption and less engine wear. Neal Manufacturing designs its HDP systems for longevity and low maintenance. The pumps feature leather cups that provide excellent internal sealing and durability for increased productivity and reduced downtime. Unlike diaphragm pumps that require daily flushing to prevent the rubber seals from degrading, users only need to flush the hydraulic piston pump once a year, if winterizing, which can save as much as 30 minutes per day in production time. The leather seals can pump as much as 200,000 gallons of mix, with normal sand load and good maintenance. The DA 350 comes standard with a 38-horsepower Kohler gasoline engine, or an optional 35-horsepower Kubota diesel engine. Both models feature an unloading valve on the auxiliary pump for easy engine starting. Additionally, the unit’s power steering provides excellent maneuverability and the tightest turning radius in the industry. The DA 350 features infinitely variable speed control from 0-11 mph in forward and reverse, and its hydrostatic rear-wheel drive gives precise control on grades and uneven surfaces. To ensure its customers know how to properly operate and maintain the machines, Neal Manufacturing offers free training seminars at its Anniston, Alabama, location. All machines are tested under load before being shipped to its customers.